This cute project looks labor intensive and I would suspect you could find the materials or similar products at your local craft store. 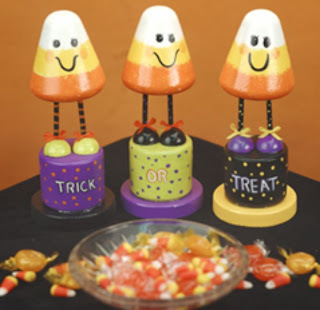 Foam shapes become fun little candy corn people in this easy painting project for Halloween. Create a trio of friends spelling out Trick or Treat. 1. Use sponge applicator to basecoat cones White. 2. Use 12 shader brush and Purple Passion, Citrus Green, and Black to basecoat cylinders. Basecoat rings Bright Yellow, Black, and Purple Passion. 3. Paint dowels Black. Let dry and cut into 3" pieces using craft knife. 4. Dropping down about an inch from cone point, sponge band of Bright Yellow around center of each. When dry, sponge another band around cone bottoms Bright Orange. When dry, use liner brush and Black to paint on faces. Dot Bright Orange on cheeks with finger tip. Highlight eye with tip of brush and White. 5. Use chalk pencil to write "Trick" on Purple Passion cylinder, "or" on Citrus Green cylinder, and "Treat" on Black cylinder. Paint letters White. Outline with Black. 6. Dot cylinders with brush handle end using Bright Orange on Purple Passion cylinder, Passion Purple on Citrus Green cylinder, and Bright Yellow on Black cylinder. 7. Cut 1" balls in half using craft knife. Paint halves using Purple Passion on one pair, Black on another, and Citrus Green on remaining pair. 8. Insert two dowels in each cone bottom. Insert other dowel ends into pair of ball halves for shoes. Adhere shoes to cylinder tops and rings to cylinder bottoms. 9. Use brush handle end to dot cylinders in contrasting colors. (Stripe and dot dowels in these colors as well.) Let dry and spray lightly with several coats of sealer and let dry. 10.Make tiny ribbon bows and attach to feet with hot glue gun. What a cute craft idea! Thanks for sharing.